Tongdosa’s Nine Dragon Pond – Wake Up and Laugh! 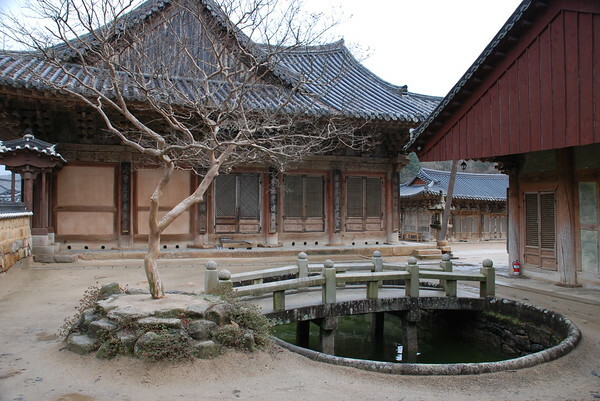 In Korea, there are three special temples know as the “Three Jewel”, each representing one of the Three Jewels of Buddhism, the Buddha, Dharma, and Sangha. Deep in the southern mountains is Tongdosa, the temple representing the Buddha, splendid in both atmosphere and spirit. But when the temple was founded in the year 646, there were nine evil dragons occupying the pond that the monk JaJang had to contend with. At first, he tried chanting a mantra to make them leave but they refused, so he brushed the character for fire on a sheet of paper and, tossing it into the air, whacked the pond with his stick. With this, the water began to boil. Soon, three of the dragon flew out from the water, but collided into a cliff and died. Five other dragons flew south, and settled permanently in what is now known as Five Dragon Valley. Finally, the last dragon emerged, blinded by the boiling water. He made a vow to JaJang that if his life were spared he would be the temple guardian. 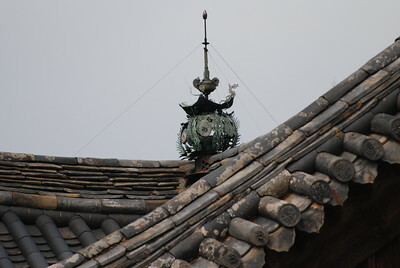 JaJang accepted his offer, and the dragon remains as the temple’s guard. Next Post always work to be done! Did you see the dragon when you visited? Maybe it’s time for another visit!